When I hear Justin Timberlake’s music, it moves my sassy spirit and makes me want to dance! Note the absence of n’Sync, which I had absolutely no interest in, popularized during my post college years; I was over the boyband thing, so Justin and crew felt like children to me. However, in 2003 when I first saw JT on Saturday Night Live singing Señorita from his new Justified album, I was instantly mesmerized. I ran out and bought the cd—an action that’s beginning to sound as archaic as buying a record album—and listened to it by the hour. Rock Your Body was the disco-esque rhythm that I craved. After all, my first email address was DiscoDaisy, inspired by my love of 70s disco music. I admired how Justin’s songs varied, hitting different genres of music—it was unlike any other artist in my lifetime. Genius. After having babies, I started to feel much older, exhausted and a bit empty…until I heard The 20/20 Experience. Listening to it transported me to unimagined worlds through the variation of tracks. Plus there were 2 entire albums with over 25 songs, some averaging 7 minutes! All I wanted for my next Christmas present was to finally see Justin in July of 2014. “He be in <his> suit and tie” “and <I> was dressed in that dress <he> likes; love <was> swinging in the air <that night>”, as my husband and I attended the much anticipated show. The dynamic dancing, mashed-up mixes, electric energy, and moving stage caused a high that I didn’t know was possible without the use of altered substances, which lasted for weeks! Then like a JT junkie, I had to have more! So we spent a small fortune on aftermarket tickets for another show at the same venue toward the end of the tour. Unfortunately, it occurred only weeks after my BRCA diagnosis and Kevin’s sudden death. Devastated beyond belief, I didn’t even want to go. Kevin was the person who cared for our girls, so that we could attend the first show; I had been surprised by how excited he was to Listen to my raves about the show—only to later find out that he was secretly a Deadhead digging JT! I ended up taking Rosey, my then 10 year-old daughter; after all, we had seen Katy Perry together when she was only 6! We had the best time together, and the show was almost as magical as the first, even allowing us to forget our immense grief for a few hours. While I didn’t anticipate a new album/concert for at least another year, Man of the Woods snuck up at the starting line of 2018, so my friend and I decided to go—and had a fabulous time. I am not as enamored with this new album, yet greatly enjoyed the concert in all its variety. Lasers beamed as dancers moved robotically during “Filthy”. On the other hand, JT played acoustic in front of a campfire surrounded by back-up singers during “Warm”. There was certainly something for every fan. I applaud how Justin experiments with different sounds, and for that, I continue to anticipate what’s next. His music moves me like almost no other—perhaps it’s because he keeps me on my toes! 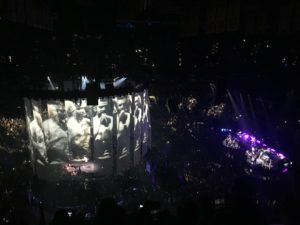 Justin Timberlake’s Let the Groove Get in song played as the stage lifted and moved across the music venue with dancers dancing and horns belting, during The 20/20 Experience World Tour. It was a moment I’ll never forget!